With Friday the 13th upon us, it seemed like an appropriate time to chat about superstitions. I consider myself to be a largely reasonable person, but for some inexplicable reason, I’m wildly superstitious. So is my sister. Black cats, walking under ladders, cracks in sidewalks – we’ll have none of it. And don’t even get me started on Friday the 13th. We avoid air travel, long-distance driving. We don’t start anything new or change routines on a Friday the 13th. According to us, the risk associated with Friday the 13th is on par with base jumping or heli-skiing. This year there are three occurrences of Friday the 13th – February, March, and November. Three is the most that there can be in any one year, and there’s always at least one. It’s been a rough few years since we also had three in 2012. For those of us keeping track, the good news is that there’s only one next year and not another set of three for almost a decade! Apparently my sister and I suffer from friggatriskaidekaphobia. Of all the things one can receive rehab for, this, sadly, doesn’t seem to be one of them. What’s a girl to do? The origin of this affliction in my sister and me is unknown. Under normal circumstances, I take every available opportunity to blame my quirks and flaws on one parent or the other; but I’m afraid I can’t toss this one over to them. My parents are frustratingly rational people. The best I can tell, they bear no responsibility in this matter. Unless of course, it was this same rationality that drove us to seek something more magical and mystical in our lives. 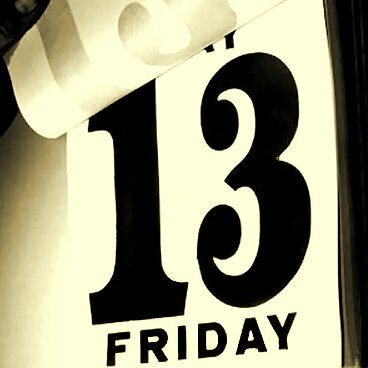 When I started working in Italy a few years ago, I didn’t know that the significance of Friday the 13th wasn’t universal. In Italy, 13 is generally considered a lucky number. It’s Friday the 17th that causes them to go running from the room. It’s been difficult for me to determine if I need to adopt this new superstition as something of an homage to my second home, or if I can keep it just to the 13th. Given that there were two instances of Friday the 17th this year, I really didn’t see the sense in taking on two more days of angst. I thought this was an incredibly rational response for me, proving my parents’ influence was indeed present. But the 13th is still a concern, so tomorrow I’ll be keeping things low-key. It’s no time to try blow fish or learn how to fence or enter an eating contest. That can all wait till the 14th. Until then, it’s safety first, people!